We are killing our dogs with kindness and cookies. Now more than ever - 40-50 per cent of dogs, according to Canine Obesity Prevention Pack (COPP), are overweight and it's primarily because we are over-feeding and under exercising our dogs. Two walks a day, everyday, is all the exercise a physically fit dog really requires. However, if your dog is overweight, the walks need to be longer and more frequent, in order to drop the weight. Overweight dogs are also in danger of suffering from cardiovascular disease, joint and ligament damage, as well as heart, lung and kidney stress. "In overweight dogs, all body structures prematurely age and can lead to [a] shortened lifespan," reports COPP. How can you tell if your dog is overweight? When looking at your dog from the side, is his stomach nice and taught? When looking at him from above, can you see your dog's waist behind his ribs? Can you feel his ribs when you place your hands on either side of his chest? If you answered 'no' to any of these questions, then you have an overweight dog. The easiest way to get the weight off is to cut off the fatty, high-calorie treats. Instead, feed your dog carrots as treats. While cutting out the cookies, increase his activity level - longer, more frequent walks, romps in the park, once-a-week at doggie daycare - anything to get your dog active. 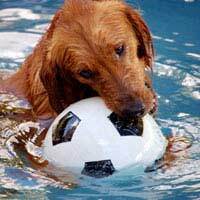 Swimming is a particularly good activity for overweight dogs as it is non-load bearing, so there is no strain placed on the already over-stressed joints, muscles and ligaments. If further measures are required, talk to your veterinarian about putting your dog on a calorie-restrictive diet. While puppies have endless amounts of energy to burn, it is important that owners don't over-exercise young, under-developed dogs, as well as engage them in activities that could compromise a puppy's skeletal structure. A small dog's growth plates, where new bones form, are fully-grown at about 10 months of age, while a larger dog's plates mature at about 14 months. For example, abstain from playing fetch with a Frisbee - they can get some rather high loft and a puppy, not knowing any better, will jump as high as he can to try and catch it. Jumping can damage the puppy's musculoskeletal system, ligaments or bones, which can create easily broken bones down the road, as well as a less-than-optimally physically capable dog. Playing fetch is a great activity, but keep the object, like a tennis ball, low to the ground. As well, only play on soft surfaces, like grass. Retrieving is an activity that not only provides great physical activity for the dog, but it's also intellectually stimulating and a great bonding experience for owner and dog. "The best exercise channels the activity of both mind and body," according to Veterinary Partner. "A dog whose exercise needs are met rests more calmly at home and [is] less fretful when left alone. Exercise can improve bone and joint health. Heart and lung function can [also] improve." Yes, there are canine athletes - they are working dogs/hunters and also agility competitors. Not only do these dogs require a lot of skills training, they also need hours of physical conditioning every week. In order to create the best conditioning program for your dog, first check with your veterinarian to ensure your dog doesn't suffer from any pre-existing conditions that would hinder his ability to perform the chosen activity. The conditioning program has to start off slowly, be done on a consistent basis and continually progress. The exercise program should also include a wide variety of activities as too much of one activity can create muscular/structural imbalances, an increased chance of bone, joint and muscle strain from being overworked, as well as lead to boredom. The conditioning program needs to also include sport-specific activities as well as general exercises. Some general conditioning activities include: daily walks, swimming and treadmill walking. No matter the size, age and breed of your dog, be careful not to over feed and under exercise your dogs. An out-of-shape, overweight dog is not a happy dog.